We strive to provide a friendly, welcoming environment. 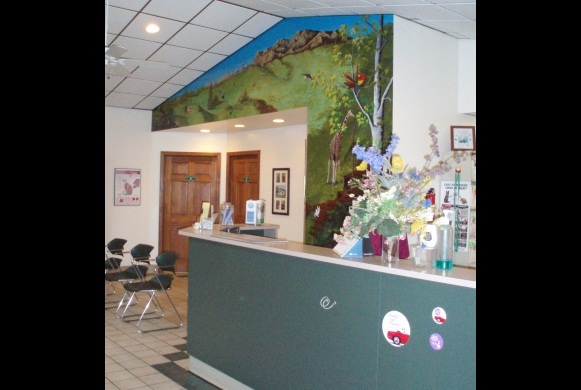 A good view of our hand painted mural featuring many different species. A close up of the hand painted mural. Comfortable waiting area for you and your pets. We carry variety of prescription pet diets for your pet's individual feeding needs. Our rotating educational displays in the reception and waiting area cover relevant topics. 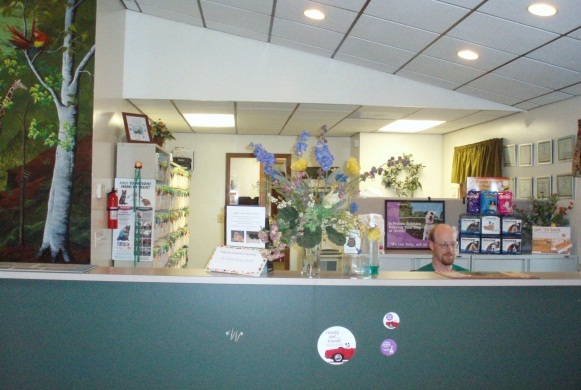 Clients are encouraged to read them and ask questions during their appointments. The largest of our exam rooms, Exam Room 1 is equipped with an adjustable table to assist larger pets onto the exam table. Our smallest exam room, this room is specially designed with our feline patients in mind. 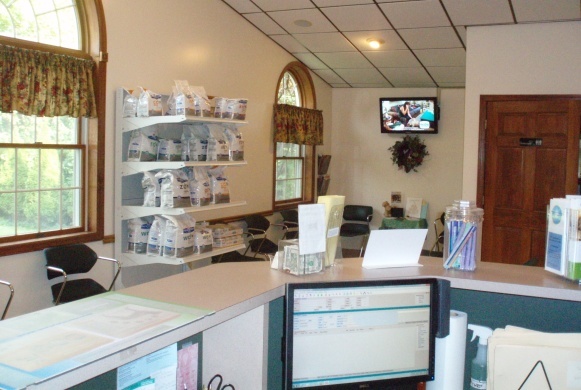 We are able to dispense many medications that the doctors prescribe for your pets. Our Practice Manager's office occasionally doubles as an extra exam room. We have the capability to run blood work in-house using our CBC and chemistry analyzers. We have an in-house x-ray machine as well as an ultrasound for your pet's imaging needs. Our portable ultrasound machine provides a second imaging capability for more detailed images of the abdomen. Anesthetized animals are monitored throughout anesthesia during all surgical procedures. Animals admitted as in-patients for routine procedures and illnesses are kept in comfortable cages in cat and dog specific wards. The door to the cat ward can be closed to minimize noise. This provides a calm environment for cats to recover.